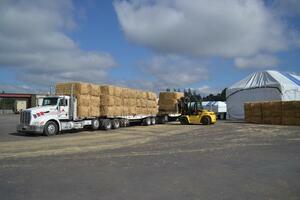 Alfalfa harvest has wrapped up for the year in Washington State. Growers completed 4th cutting last week, and we are seeing good test results from stacks so far. In Oregon, some fields are left to be baled in Klamath Falls from 4th cutting. This final cutting will likely be domestic dairy grades and will be complete over the next seven days. In New Mexico, growers resumed cutting halfway through the week after waiting out weather challenges. They have about 60% cut and 40% of fields baled so far, and quality is expected to be lower end grades. Harvest in Arizona is on hold due to rains over the last several days causing over maturity for some fields. Cutting will restart with clear weather windows. Growers have completed third cutting in Washington State. A very small amount was baled and is domestic quality. Straw harvest is complete, and we have not seen any quality issues this year. For information on ordering Alfalfa Hay, Timothy Hay or Straw Products, please contact us today.